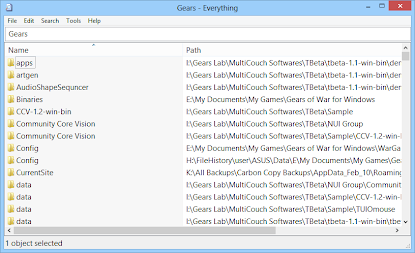 Everything is a Windows file searching alternative solution that is developed to rapidly searches the entire hard drive for the files you’re looking for. Everything is designed unlike Windows search, "Everything" initially displays every file and folder on your computer and even on search other computer using the network communication (hence the name "Everything"). Everything is a index based fast file and folder search engine which indexes your entire hard drives files location and creates a database to enable you locate your files and folders instantly by searching with keywords or phrases. After Everything is installed it will begin indexing all your files. Indexing can take a minute, the progress is displayed in the status bar. By default, Everything creates and maintains the database for all NTFS volumes. You can change the volumes you wish to include in the database. From Everything volume option you can modify your priority of file indexing. You can also exclude files and folders that you don’t want to include in the file database. Match the case: When enabled the search string is case-sensitive. Example foo will not match FOO. foo will only match foo When disabled the search string is case-insensitive. This is disabled by default. You type in a search filter to limit what files and folders are displayed. Match whole words only: When enabled the search string will only match words with white spaces at the start and end. Example: foo will not match food. foo will only match foo When disabled the search string can appear anywhere inside the folder or file name. This is disabled by default. Match path: Match the full path name. When enabled the search string is matched against the full path name. Example c:\ will find all the files on the c volume. When Disabled only folder and file names are matched. This is disabled by default. Note: Enabling this will make searching slower.